New analysis of the finances of Formula One motor racing has revealed the huge profits made by the sport's owners. The Formula Money report says that F1's holding company made net profits in 2010 of $137.1m (£85m) after costs, which included paying race teams $658m. 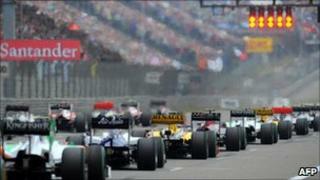 It brings the net profits made since private equity firm CVC took control of F1 in 2006 to $1.22bn, the report says. Formula Money's release on Thursday comes amid speculation that potential bidders are circling F1. CVC, which now owns 63.4% of F1's Jersey-based parent company Delta Topco, made $87m from the sport in 2010, Formula Money estimates. The remaining $50m in profits was split between investment banks and individuals who own the rest of Delta Topco, including Sir Martin Sorrell, boss of advertising giant WPP with a 0.3% stake. And it brings to $800.8m the profits CVC has made in the five years since it paid $1.7bn for 69.6% of F1's commercial arm, the report says. Christian Sylt, who with colleague Caroline Reid publishes the annual dissection of F1's finances, said that Delta Topco made revenues of $1.6bn last year, and $5.9bn over the five years. "It's an astonishing return," he said. CVC bought majority control of F1 from Bernie Ecclestone's family trusts and a group of investment banks. Mr Ecclestone remains the sport's chief executive and a large shareholder in Delta Topco. The analysis reveals that Mr Ecclestone and his family trusts have earned more than $148m in five years from their stakes in Delta Topco. The F1 ringmaster has also received $31m in salary. The biggest single source of revenue last year was the race-hosting fees of about $567.5m, paid by governments and track owners to stage the events. The increase in profits came despite a small fall in television audiences to about 527 million last year, and a decline in ticket sales, which Mr Sylt attributes to an increase in prices. He said that Delta Topco paid off $338.5m of debts - and $59.2m in interest payments - last year, leaving the holding company with about $2bn of debts. Based on the latest figures Mr Sylt puts a $5bn-$7bn price tag on F1. "It's at least worth that, and may be worth more to a determined buyer," he said. There has been a series of reports recently linking Rupert Murdoch's News Corporation as a possible bidder for F1's commercial rights. New Corp was rumoured to have sounded out a number of potential bid partners, most recently Exor, the Agnelli family's investment vehicle, which indirectly owns Ferrari, F1's star team. However, Mr Sylt, business editor of the website pitpass.com, believes a News Corp bid is highly unlikely. Firstly, News Corp, which owns television stations, would face regulatory hurdles, he said. More significantly, he believes, the terms of the Delta Topco share structure and complex contracts with the racing teams make any attempt to buy the business extremely difficult. "From what I hear from the inside, this idea of a News Corp bid is a non-starter. All it's done is just focus attention on how valuable F1 is," Mr Sylt said. The contracts with the teams, called the Concorde Agreement, expire in 2012 and preliminary renegotiations have already started. "I think all this stuff about bids has a lot to do with a new Concorde Agreement," he said. Several team owners have already indicated that they would like a larger slice of revenues from F1's commercial operations. The teams received $215.7m in 2006, rising to $658m last year.